Starbucks…Who doesn’t want cupcakes with their coffee? 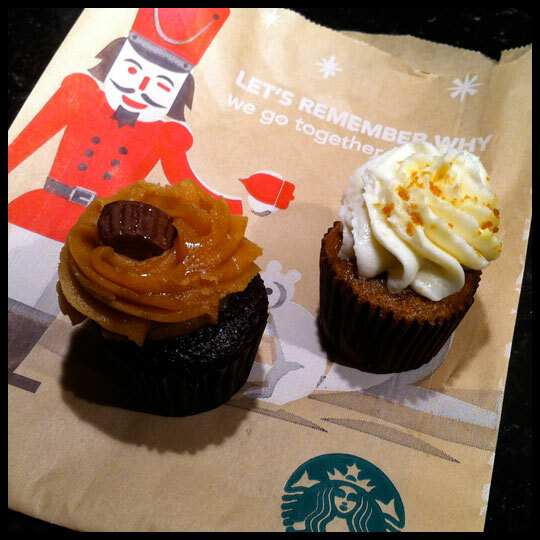 On a recent trip to Starbucks, I finally broke down and got a couple of their mini cupcakes to go along with my decaf Americano (cream and sugar, please!). They had two options, chocolate peanut butter and carrot cake. I was a little disappointed when the employee couldn’t confirm for me that the carrot cake was carrot cake, but this particular location also got my drink order wrong…twice…which is always a disappointment when going into a place that is suppose to be the most popular coffeehouse for a reason. However, I still left happy to have sweets in one hand and a grande hot coffee in the other on a cold rainy day. As you can see from the photo, the peanut butter frosting on the chocolate cupcake had an almost translucent appearance. My only thought for this was, butter! The frosting tasted like straight peanut butter, which was very pleasing, however the texture wasn’t what I prefer on a cupcake. The cake had good chocolate favor, but wasn’t very moist. My guess is that this is because their treats are trucked in. Carrot cake is usually one of my favorite cake flavors. I love a spiced cake that you can get all year round. However there was nothing memorable about this cupcake…maybe that’s why the employee couldn’t tell me what it was? Despite my lack of enthusiasm over these mini cupcakes, I still love Starbucks. They specialize in coffee and don’t pretend to be a bakery. I appreciate that they offer fun sweet options, including bite-size minis, to accompany their beverages, should their guest like to indulge a bit more. I still think their Rocky Road Cake Pop is amazing and I’m looking forward to trying their seasonal treats, such as their Chocolate Crème Whoopie Pie and the Peppermint Brownie Cake Pop (Crusader Stacy will be posting her review on this, and other cake pops, tomorrow)! This entry was posted in Cupcakes, Maryland, Starbucks and tagged Annapolis, carrot cake, Cupcake, mini cupcakes, peanut butter chocolate, Starbucks by Crusader Jenn. Bookmark the permalink. real friends don’t let their friends eat Starbucks cupcakes! they are the worse I have ever had – the cake pops are awful as are the whoopie pies. Hahaha! Us crusaders don’t keep each other away from any cupcake, since we’ve vowed to “try them all,” even from grocery stores! Unfortunately I’ve had worse cupcakes from legitimate bakeries…yikes. It’s always good to get other opinions so thank you for your comment and for reading!